2-channel radiation monitor and controller. Like Sensor Monitor 5.0 but with two measuring inputs for simultaneous measurement/switching with two probes/photodiodes, for measurement of two different radiation sources or at two different measurement points. Various logic combinations of both signal inputs with the three relays. 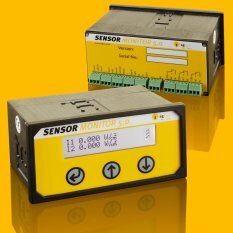 The Sensor Monitor 5.0 series are measurement and control modules for monitoring and automating irradiation processes. They display radiation, dose and state information which is simultaneously provided via USB/RS232. Three programmable relays allow automated control of single- and multi-level irradiation processes. The Sensor Monitor 5.0 is used as a radiation monitor or control module in disinfection, drying, hardening, biotechnology and in scientific research.